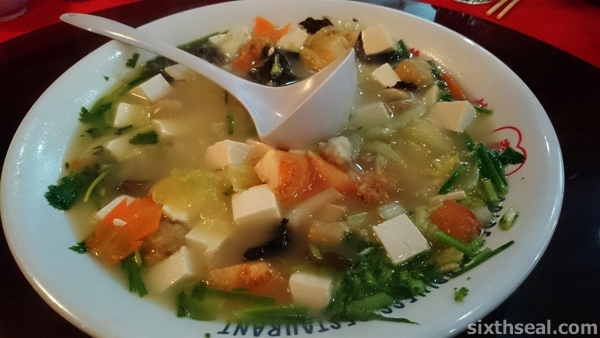 This is not your usual tofu soup. I love the addition of tomatoes for umami. There are also lots of aromatics and for body, the house-made fishballs and meatballs go well with the black fungus. The plating is very nice too, they don’t slop everything into a deep bowl but rather dish it out on a wide plate so all the ingredients are visible, submersing with the broth. 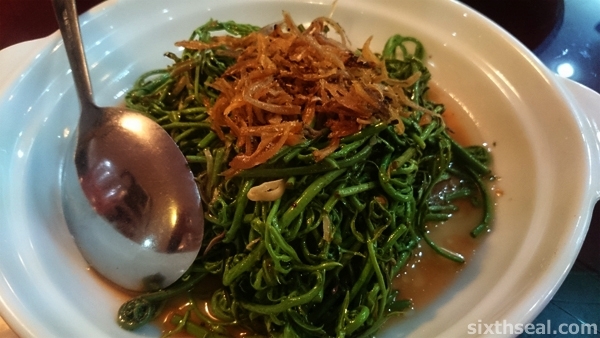 This is our beloved midin (fiddlehead fern) cooked in Foochow red wine. It’s cooked just right so the ferns are still slightly crispy, and not soggy. The pairing with local red wine and crunchy bits of anchovies to top off this dish makes it simply perfect! These noodles are actually called “chao chu mien” e.g. they’ve been fried before being poached in liquid. 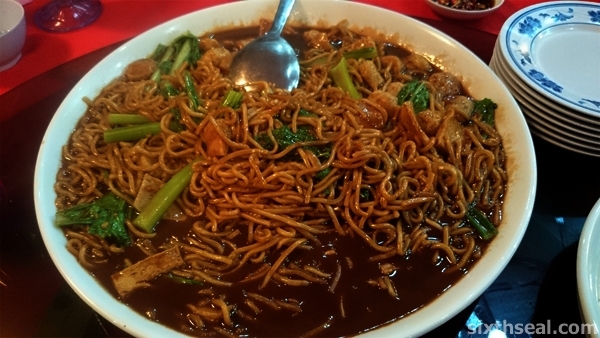 It’s a distinctively Foochow way of cooking and the noodles tastes heavily of lard. It’s lovely! Golden Happiness Restaurant will actually serve the dishes in order of intensity of taste e.g. from least nuanced to the most flavorful but this was an exception as we were hungry and wanted it out. 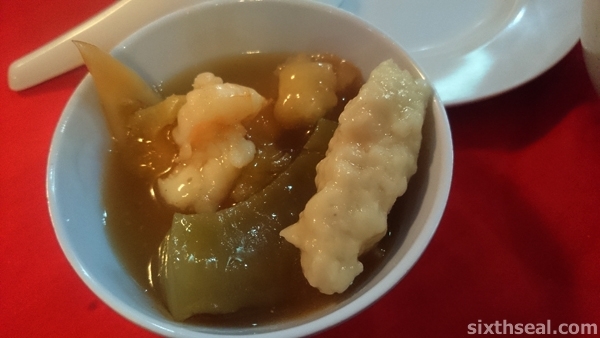 This is fish maw stuffed with fu chuk (beancurd skin) and some other items. It’s quite lovely and the texture is different. I like how the gravy goes very well with rice. That’s actually the translated Chinese name for this flagship dish. Haha! 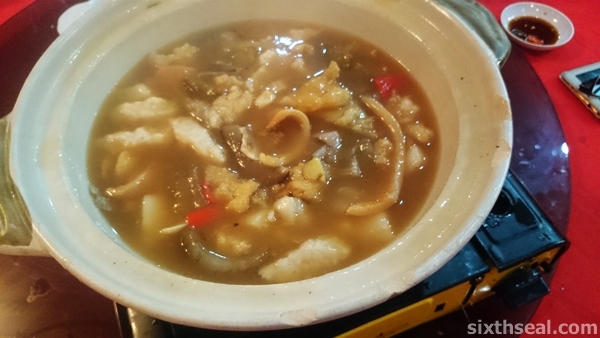 It’s quite flowery but essentially it’s prawns, fish slices, sea cucumber, squid, cuttlefish, fish maw and other interesting and delicious bits of seafood thrown into a pot. …replace this claypot on the heat source. This is a unique combination of pig tail, pork belly and duck! 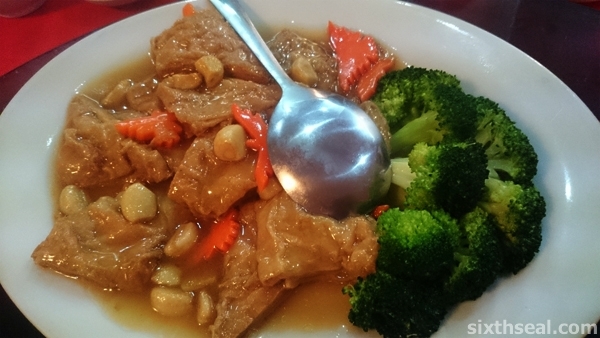 I’ve only seen it served here at Golden Happiness – it’s one of their signature dishes. I was a bit hesitant when I heard of the combination at first, but duck goes very well with pork and the pig tail adds a wonderful chewiness (and a ton of collagen and gelatine) into the mix. Golden Happiness Restaurant is one of the higher end Chinese banquet places in town. I like how the front of house floor manager wears a suit and all her waitresses don traditional matching Chinese uniforms. 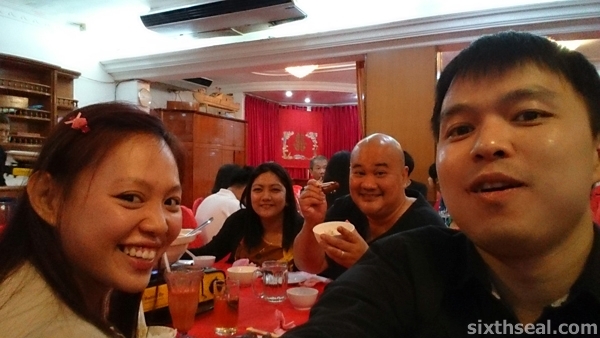 It conveys a sense of professionalism that is lacking in a lot of Sibu restaurants. I had one of my last suppers here with my bro Eddy, Jona and a bunch of other close friends. The food here is top-notch, and they have several house specialities that sets them apart. Thanks for the awesome dinner, homeboys! Nice foochow food! Been a while since I had some! This is a higher end restaurant so the prices are higher than normal places that we go to e.g. Ruby and Ming Mei Shi but the food is a lot better too. I like the service coz they’re very professional – coats for the front of house manager and her staff all have uniforms. Why Last Supper? You’re not going to come back again? Of course I’m coming back home again. Haha. I love that pot of tofu soup, Foochow noodles (looks like Hailam mee to me) and that “Abundance” seafood pot.. I can finish everything by myself! I usually boil very simple tofu soup – pork ribs or chicken carcass, carrots, tomatoes, tofu and harm choy (salted vege), that’s all, but that harm choy really makes a difference, nice.. But of course, not as nice as restaurant soup la..
Foochow noodles tastes different from Hailam mee too (which doesn’t have that distinctive taste to it). Yeah, I usually am not fond of tofu but I like Golden Happiness’ Tofu Soup and the way they present it looks more appetizing too. This is one of the better places in town to have a sit down banquet dinner. Well, about the same thing anyway – the texture is different, of course but the taste is pretty similar. 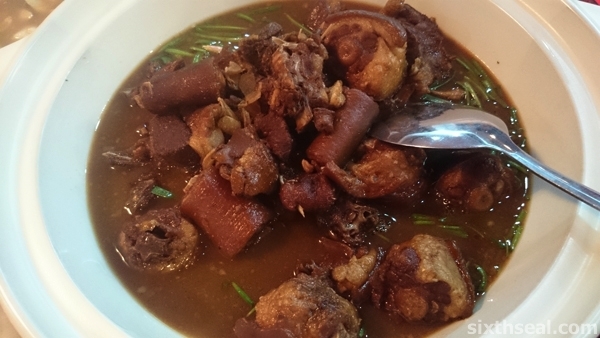 There’s not a lot of meat though – unlike pig’s ears, not the entire tail can be eaten coz of the bone, but it’s very flavorful!